For people in parts of South Coastal, South East Coastal and Great Southern districts. Issued at 9:22 pm Saturday, 13 April 2019. 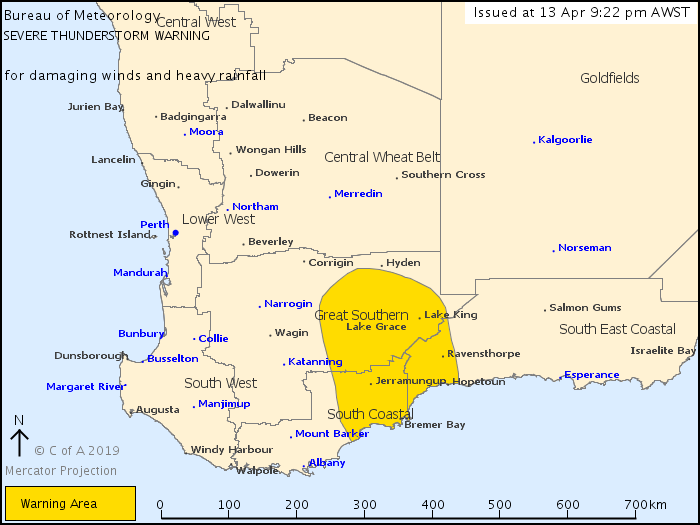 Severe thunderstorms possible in eastern parts of the South West Land Division. Weather Situation: A trough extends from the Gascoyne to the south coast with thunderstorm activity occurring through northern and eastern parts of the South West Land Division. Severe thunderstorms are likely to produce damaging winds and heavy rainfall that may lead to flash flooding in the warning area over the next several hours. Locations which may be affected include Bremer Bay, Hopetoun, Jerramungup, Lake Grace, Lake King and Ravensthorpe. Gnowangerup recorded a wind gust of 102 km/h at 6:25pm AWST. The overall weather pattern is not unusual for this time of year but severe weather may occur in some parts of the warning area. * If there is flooding, create your own sandbags by using pillow cases filled with sand and place them around doorways to protect your home. * Do not drive into water of unknown depth and current. * Slow down and turn your headlights on. * If it is raining heavily and you cannot see, pull over and park with your hazard lights on until the rain clears.